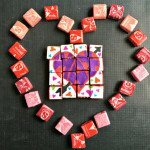 This is a fun Valentines Day candy puzzle that your kids can make. Using candy as puzzle pieces makes for an easy and fun craft for school. Adapted from Parents.com. If using the 3"x4" labels, cut of one inch to make a 3"x3" label. Color your design on the front with Markers. I used Sharpies for the best coverage. Make sure you color as much of the label as you can so the puzzle is easy to solve when you are done. Either cut your label into 16 equal pieces via the lines on the back. OR Arrange 16 pieces of candies on the sticky side of the label to fill it up. Carefully cut the candies apart to get your 16 pieces of the puzzle. Mix up the pieces and have the kids solve the puzzle. Package in snack size baggies for a cute favor.